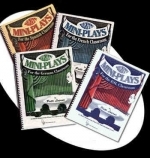 A collection of 12 very humorous short plays designed for middle school and high school. THE CLASSROOM IS THE STAGE! YOUR STUDENTS ARE THE "STARS"! Features core vocabulary and structures from Level 1 French curriculums by means of lively, catchy original tunes and clever, yet simple lyrics. Popular with teachers and students in both elementary and secondary classes because of their humorous, repetitive lyrics and the wide variety of musical styles.